In this exercise, improvisers will play a bass line accompaniment and solo at the same time. This is a great exercise that I created after hearing some brass bands in New Orleans. It is a great technical workout, sounds great, and really forces the improviser to work on their time. Pick a key that you feel comfortable with and make sure that you can play the blues scale from memory. Never try to improvise if you worrying about playing the right notes! 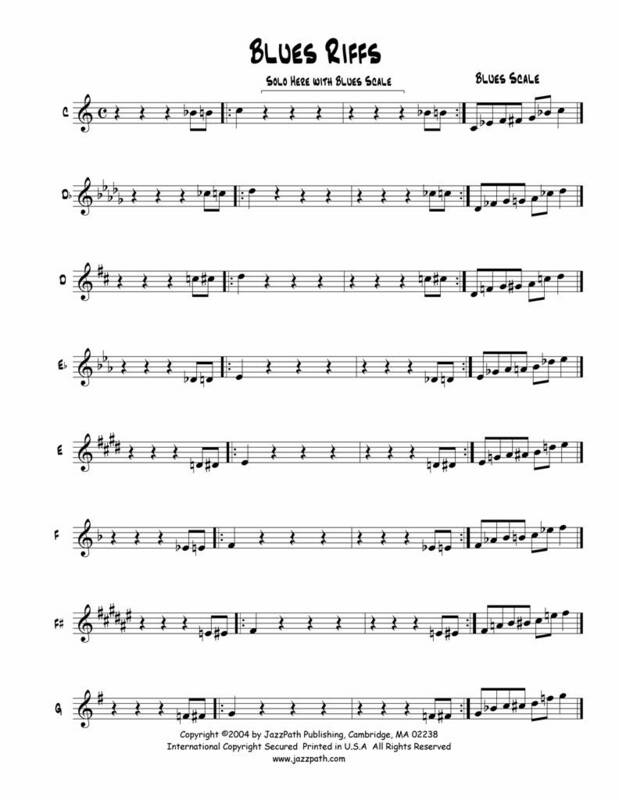 Practice playing the �bass line� i.e. the written part. Make sure you play the appropriate amount of rests. It is critical to count the rests. Play the bass line and trying humming or singing a solo in the rests. It is critical that you do not add any beats. Get in the habit of making the analytical side of your brain, which is reading the notes for the �bass part�, work with the creative side of your brain, which is humming the solo. Trying playing the bass line accompaniment while playing short solo phrases in the rests. This can be challenging, but it should sound great. Focus on playing with rhythmic accuracy and rhythmic variety! I recommend playing all eighth notes in this exercise straight and trying to make it sound funky. When you can do it one key, try it in another key. This exercise sounds the best when you change keys! Try playing the �C� for 4 times and then modulate to a new key! Remember to focus on the tempo and do not add any beats! This exercise also sounds good if you play it with another instrument. Have a friend play the �bass� part while you solo and then reciprocate. It can create an easy jam session for two people!